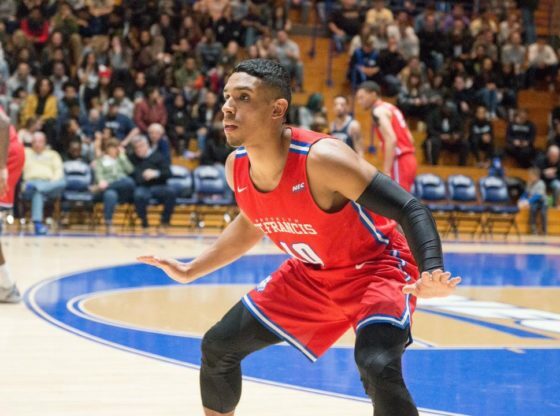 The St. Francis men’s basketball team (14-10, 6-5 NEC) got back to winning ways by defeating the Wagner Seahawks (10-12, 5-6 NEC) in a final score of 51-44 on Thursday night. The Terriers are now in 4th place in the NEC standings and will hope to continue their streak with three straight home games ahead. With only 28 seconds left in yesterdays game, point guard Glenn Sanabria was able to capture the victory for St. Francis as he hit a three-point shot to give the team a 47-44 lead. That 3-point play was followed by four free throws to seal the deal. This was a much-needed win for St. Francis as they just came off of a two-game losing streak on the road this past weekend. In a low scoring game, St. Francis struggled to get going in the first half as they trailed the visitors. Truth be told, it was a victory they had to fight very hard to secure. Three Terriers finished in double digit points as Junior Rosel Hurley lead the team with 12 points, following with Glenn Sanabria’s 11 points and Jalen Jordan’s 10 points. The Terriers now play Fairleigh Dickinson University on Saturday, February 9th, 2019, at 4:00 pm.